XOSPATA Support Solutions offers access and reimbursement support to help patients access XOSPATA. XOSPATA Support Solutions provides information regarding patient healthcare coverage options and financial assistance information that may be available to help patients with financial needs. As part of benefits verification support, XOSPATA Support Solutions will inform you of those XOSPATA limited network specialty pharmacies that participate with your patient’s insurer. XOSPATA Support Solutions or the XOSPATA network specialty pharmacy will confirm your patient’s insurance coverage and provide prior authorization assistance. The prescription will be dispensed by a XOSPATA network specialty pharmacy and shipped directly to your patient’s home. XOSPATA Support Solutions can provide information about potential programs and patient assistance options that may be available to your patients. 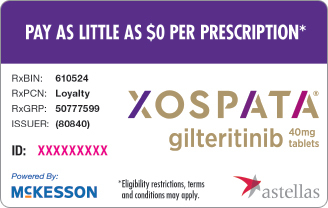 The XOSPATA Copay Card Program* allows eligible patients with commercial prescription insurance to pay as little as $0 per prescription. *In order to participate in the XOSPATA Copay Card Program (“Program”), a patient must have commercial prescription insurance for XOSPATA. The Program is not valid for patients whose prescription claims are reimbursed, in whole or in part, by any state or federal government program, including, but not limited to, Medicaid, Medicare, Medigap, Department of Defense (DoD), Veterans Affairs (VA), TRICARE, Puerto Rico Government Insurance, or any state patient or pharmaceutical assistance program. This offer is not valid for cash-paying patients. This Program is void where prohibited by law. Certain rules and restrictions apply. Astellas reserves the right to revoke, rescind, or amend this offer without notice. †Subject to eligibility. Void where prohibited by law. &ddagger;XOSPATA Support Solutions has no control over the decisions made by, and does not guarantee support from, independent third parties. XOSPATA Support Solutions offers additional patient and caregiver support to patients who have been prescribed XOSPATA. This additional support helps connect your patient and their caregivers to educational resources and support based on their particular needs to help them manage their disease and daily life while on treatment. Patients and their caregivers can call XOSPATA Support Solutions at 1-844-632-9272, Monday–Friday, 8:30 am–8:00 pm ET to learn about potential resources offered. §Support is provided through third-party organizations that operate independently and are not controlled or endorsed by Astellas. Availability of support and eligibility requirements are determined by these organizations. The XOSPATA QUICK START+ Program provides a one-time, 7-day supply of XOSPATA at no cost to eligible patients who experience an insurance-related delay. XOSPATA Support Solutions offers overnight shipping directly to your patient. For more information on the XOSPATA QUICK START+ Program, call 1-844-632-9272 or visit XOSPATASupportSolutions.com.